toys-toys-toys.co.uk: Give your home the scare-factor this Halloween! In the weeks leading up to Halloween, I start planning on how im going to make my house the scariest on my street. Similar to Christmas, everyone wants to have the best looking house. Especially if your throwing a Halloween party. So here are a few tips and ideas on how to spook up your home. 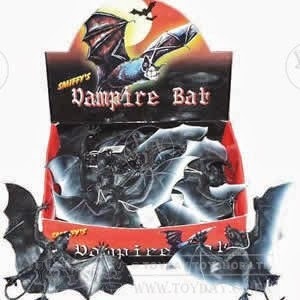 Starting with the "Black Vampire Bat" perfect for indoor or outdoor use. For example hanging from tree's, bushes, gates and lights outside. Or from ceilings, light fixtures and door frames inside. The possibilities are endless. 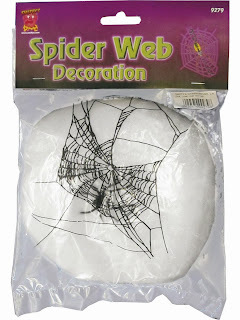 Spiders webs! For people that are scared of spiders, which truth be told is A LOT of people there's nothing worse than walking into one of their sticky wispy webs! Easy to put up, add the spooky factor instantly. Again can be used inside or out. 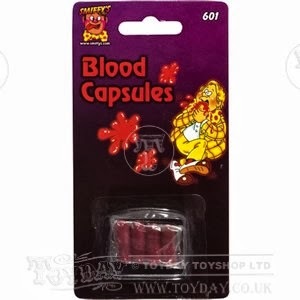 Here is an example of how you could use the "Spider Web Decoration"
Frothing Blood Capsules a brilliant, creative ( but sometimes a little messy) way to bring a bit of terror to your home! Weather used for adding gore to a costume or halloween decorations a bit of false blood is bound to achieve the desired effect...terror!! 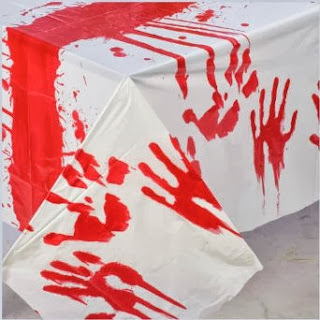 As you can see a bit of fake bloody hand prints can transform a tablecloth. 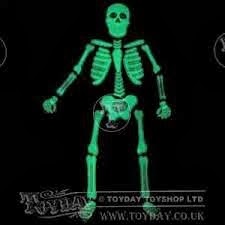 The Glow Skeleton Window Sticker! 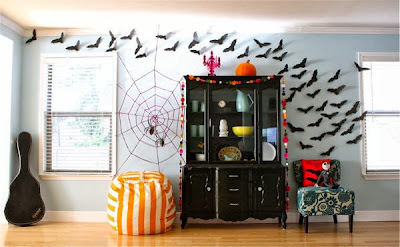 A bit of spook-tastic fun to add to any window in your household. 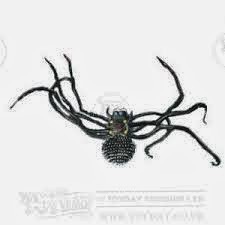 The Hanging Toy Spider will hang perfectly with the Black Vampire Bat, or with the elasticated string attached to it can be bounced up and down, used as a practical joke to scare someone.